The official website for the previously announced TV anime of Nana Maru San Batsu has revamped and announced main staff and cast members. The official Twitter account will post two videos to guess the cast members for Gakuto Sasajima and Chisato Mikuriya on March 7 and 14, respectively. The anime is slated for Summer 2017 via Nihon TV. A stage event for the anime will be held at AnimeJapan 2017 on March 25 and 26, where Shun Horie, the cast member for Gakuto Sasajima, and mangaka Iqura Sugimoto will attend. 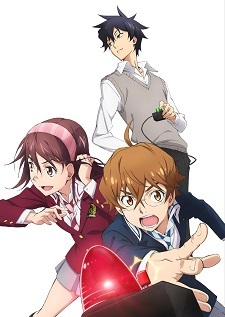 Nana Maru San Batsu ~7O3X~ has been serialized in Young Ace since November 2010. A total of 13 compiled volumes have been released, with the latest volume published on December 31, 2016. Definitly looked like a summer anime when it was announced. Glad that i was right. Interested to try it with that premise. Kinda conflicted with the staff but not very much, will see and check this out. The character looks interesting for seinen anime.I am really looking forward to this. Edit (Answer Revealed on March 10): Gakuto Sasajima will be voiced by Takuya Satou. Edit (Answer Revealed on March 17): Chisato Mikuriya will be voiced by Kaito Ishikawa. Edit (Answer Revealed on April 14): Daisuke Inoue will be voiced by Tasuku Hatanaka. Edit (Answer Revealed on April 21): Akira Sonohara will be voiced by Takuma Nagatsuka. Edit (Answer Revealed on April 27): Jinko Sasajima will be voiced by Satsumi Matsuda.